The public is encouraged to participate in the task teams, which will focus on moving the college in a positive direction. The kick-off meeting for all 4 teams will be Thursday, January 11 at 2 p.m.
All community members who reside in GBC’s area of outreach are all welcome. Task team meetings will be made available to outlying areas via interactive video at all GBC site locations in Battle Mountain, Ely, Pahrump and Winnemucca. College Revitalization: What comprises the "college experience" among the markets we serve and how do we strengthen that? College Athletics: What are our community and student expectations? GBC Latino Student Population: How have we prepared for the tremendous growth in this student population? New Programs: What are the needs in the geographical areas we serve that warrant expansion or creation of new programming? The four task teams will meet individually January through March. Recommendation from the task teams will follow, with anticipated implementation by the fall. If you would like to participate on a team, contact Mardell Wilkins at 775-753-2265 or e-mail mardell.wilkins@gbcnv.edu by January 11. 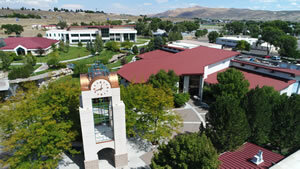 The live meeting will be held at the GBC campus in Elko in the Greenhaw Technical Arts building, room 130. Interactive video locations: GBC Battle Mountain room 2, GBC Ely room 118, GBC Pahrump Valley Center room 124 and GBC Winnemucca Center room 123.